ATI Industrial Automation offers its Mini40 compact force/torque sensor featuring a low-profile design with a through-hole for cable passage. This compact force/torque sensor is made from high yield-strength stainless steel, and delivers overload values of 4.2 to 18.9 times rated capacities. 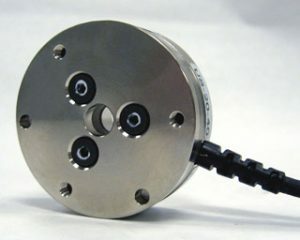 An E-exit version of this transducer is also available and supports resistance to a 10 lb cable pull force. The silicon strain gages provide a signal 75 times stronger than conventional foil gages. This amplified signal results in near-zero noise distortion. The IP65 version of the Mini40 is protected against water spray. The IP68 version is submergible in fresh water to a depth of 10 meters.